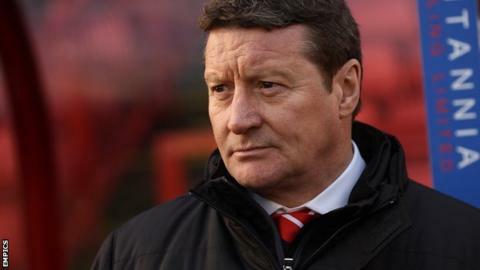 League One side Barnsley have sacked manager Danny Wilson and assistant boss Chris Hutchings. The Tykes are 17th in the table, seven points clear of the relegation zone and seven off the play-off places. Wilson, 55, who led Barnsley to the Premiership in 1997, returned to Oakwell for a second spell as boss in December 2013, but was unable to stop them being relegated last season. In a statement, the club called the current league position "unacceptable". Wilson first took over at Barnsley in 1994 but left for Sheffield Wednesday in 1998 after the Tykes were relegated back to the second tier following one season in the top flight. The former Northern Ireland international midfielder went on to have spells in charge at Bristol City, MK Dons, Hartlepool, Swindon and Sheffield United before returning to the club after the sacking of David Flitcroft. "Danny Wilson took over at Barnsley in difficult circumstances, and couldn't halt the slide. "The plan for a young and hungry team has merits but it was never settled and the loss of key players to injury haven't helped him. "On their day the Reds looked extremely capable, but that clearly hasn't happened enough. "The immediate reaction to Wilson's departure has been mixed, with some fans thinking he should have been given longer." Wilson reached 1,000 games in management in December and said at the time that he felt the achievement would become rarer as clubs sought immediate results. Following Tuesday's 2-1 home defeat by Fleetwood, he acknowledged that his position was in doubt. He told BBC Radio Sheffield: "Everyone wants to see their team win at home and the inconsistency is there to be seen. "We have to persevere and be patient, but whether that is a watchword that is at a premium at this moment in time we will have to wait and see." Academy coach Mark Burton and development coach Paul Heckingbottom have been placed in caretaker charge for the game against struggling Crawley on Saturday.